Thank you to Netgalley & Random House UK for providing me a e-ARC of this title. My opinions are my own. Zack Lightman is one of the world’s top player of the online game, Armada, which revolves around the defence of Earth from alien invasion. He starts off the novel aimless in his real life, preferring to retreat to gaming or scouring his dead father’s secret stash of conspiracy theories regarding the government’s plan for the world’s top gamers. Just when Zack thinks he’s finally lost his marbles, it turns out that his father was correct – Earth is under threat and it’s up to him and his fellow players to save it. In an effort to pay homage to Armada, I shall try to shoehorn in as many appropriate gifs in this review as possible. I’m a bad-news-first kinda gal, so let’s start by airing Armada’s weak spots. None of the characters were relatable for me -but then again, I don’t play MMOs and my closest brush with gaming are limited to PS1/PS2 RPGs and 6 generations of Pokemon (shush! ); plus my only nerd-cred remains my ability to quote the LOTR trilogy. Zack Lightman, our narrator, was the only person to undergo any semblance of growth in the book. Though we saw the events through his eyes, I never got attached to Zack, nor did I feel for his daddy issues or lack of direction in life. His narrative voice also felt very young to me, though he was supposedly 18, Zack read like a 14 year old at most? His friends and allies got even poorer treatments, each being reduced to shallow character types: like the Chinese guy and the hot hacker love interest. I wish I cared more for these characters as the book lost a lot of emotional punch in its climactic scene. The plot also got lost in all the pop culture trivia– it felt like the book was created to be a galore of nerd references, rather than having the references supplementing an existing storyline. While the references were fun, Armada lost itself in its frenzied homage of past scifi flicks -to the point where the actual content of the book ceases to be memorable. I sort of love how unabashedly ludicrous the plot is! I imagine a legion of people like my little brother being enlisted as soldiers and it’s all sorts of hilarious. These kids aren’t soldiers, and the book understands that – never ceasing in showing us their uncertainty and endless banter, even in the face of a full blown alien invasion. The conspiracy theories flying about in the book were also highly entertaining – it’s possibly the highest form of wish fulfilments for all nerds to know there’s a higher purpose to all those hours they spend playing WoW and the likes. Now, can someone please come up with a reason why all these hours I spend blogging is going to save the world? Although I felt that the references were excessive, I was still delighted every time I see a character arguing over ‘The Best Melee Weapon in Cinematic Verse’ or quoting LOTR/Star Wars. The book was very tongue-in-cheek, it was fully self-aware a lot of plot elements were lifted directly from apocalyptic movies – and had no qualms in trumpeting the fact. The ending of the book was also interesting, the plot played out in a slightly unexpected way – and it leaves room for future conflict with an even more sinister figure. I think Armada has garnered enough of my interest for me to pick up the inevitable sequel. Armada, while not page-turning, was also an incredibly fun and easy read. I can’t say I am the target audience for this book, but I can still appreciate it for what it is: a nice nostalgia trip for the game/scifi-inclined individuals. I heard that Ready Player One is a far stronger book, and I am excited to check that one out at some point. A lot of people have said RPO is a better book overall! I’m excited to check it out. And yes, I need to up my gif game haha. Once you start putting them in your reviews, you really can’t stop. I’m definitely not the target audience of this book so I’m leaning more towards not picking it up… but so much hype! It was still a fun read – maybe you can try Ready Player One first? Yeah I probably will. I’ve been meaning to read that for a while so hopefully I can get to it before the movie comes out. I loved Ready Player One although I didn’t completely understand the pop culture references. I’m a little worried that I may not be able to enjoy Armada as much if there were that many references this time because when I read RPO, I was really lenient when it came to reading. I hope I enjoyed it at least as much as you did though. Armada’s references are like 80s games and scifi film, I felt a bit lost too haha. But I hope you enjoy this one, too! We shared many of the same sentiments! Glad to know I wasn’t alone. I really wanted to love this book for the crazy thing that it was, but there were a few glaring issues that held me at bay. To everyone considering RPO, I wholeheartedly recommend it! Yes, I will definitely look into getting a copy of RPO, thanks for stopping by, Joe! Fantastic review!! I heard of this author when everyone seemed to be reading Ready Player One, but I normally don’t read this genre, so I didn’t think much of it. Well just a few days ago I was given the opportunity to meet Ernest Cline at the end of this month, so I decided I would need to read one of his books. This review was wonderful in letting me know what I’ll be getting myself into. I am not super nerdy although I do know my fair share about Star Wars, so I hope I can keep up! Nice review! 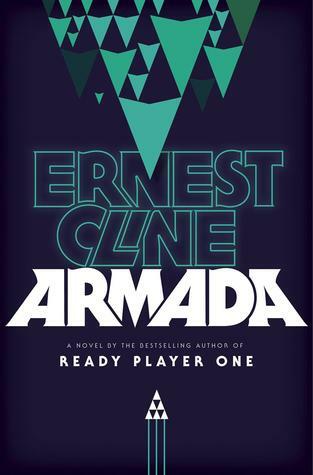 I just read Ready Player One recently, and adored it so I was excited to find Armada had just been published and that I could go straight on and read that, which I’m doing at the moment. So far although it’s a lot of fun there isn’t as quite as much of an in-plot excuse for all the pop culture references as there is in Ready Player One, so I don’t think it works quite as well, although I’ll reserve full judgement until I’ve finished it.